This is something a little different, an acrylic on gesso board, size 6 by 6 inches. I saw these little Ampersand gesso boards at the art supply store and thought they were so cute, I wonder what I could do with these? ...Along with a visit to the Equine Affaire Horse Expo and so many different horse breeds to see....and this is what I came up with! It was a cold windy day and I couldn't help but think this draft horse would be a handful to hold on to. Very cool, Maria! 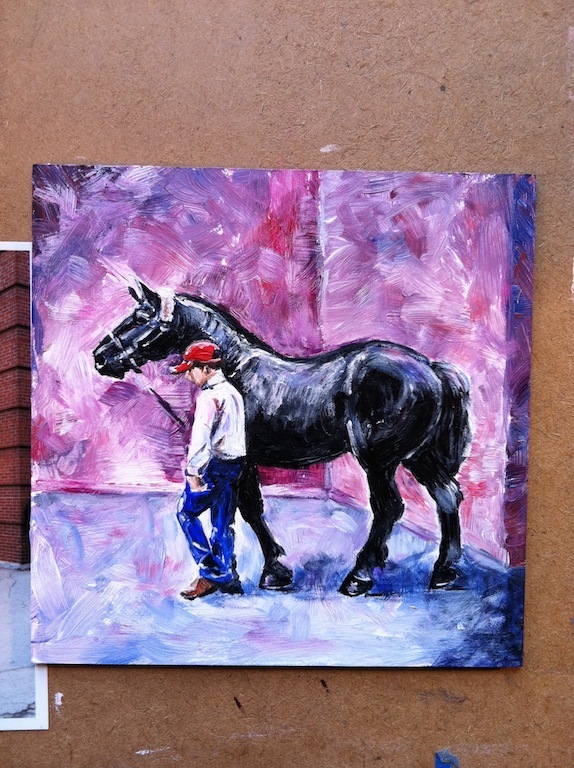 I have only used oils on gessoed masonite, never tried acrylics. Love your painting and the nice, strong colors! 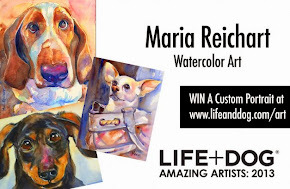 Wow, Maria, it's great - love how you painted the background, gorgeous colors. Wow! Great colors and lighting, and I'm glad you're having fun with the acrylics! Thank you everyone, so happy that you like him, the bright colors were fun to play with. Diana, I completely see what you mean, with the corner of the wall being distracting, I am a little weak in the composition part of my art journey, but I am so glad that you pointed it out. I learn so much from all of you! Pointers are always welcome and appreciated. Hi Maria! Love your work. Would you like to join us at www.watercolorwednesdays.blogspot.com ? I think your work would look great there. Julia, I loved seeing your blog and paintings, truly amazing. Thanks for visiting and I appreciate your kind comments. Linda, thank you so much, I will wander over to your blog to explore! It's wonderful, and the violet and pink background makes the figures really pop up! Brava!